Hand-embroidered designs of little boys and girls with different hair styles, clothes and facial expressions. The designs are done on fabric, stuffed with acrylic fibre and are hand washable. 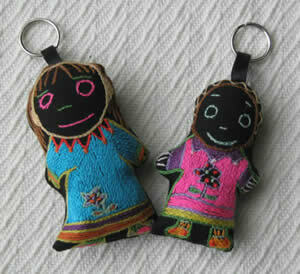 The dolls are about 5cm in size. Price R62.50. All pricing excludes postage. Wholesale pricing is available on request.